(Inside Science) -- It’s no secret that the U.K. has an insatiable appetite for sandwiches. Scientists estimate 11.5 billion sandwiches are consumed in the country every year, of which half are prepackaged. The demand for ready-made sandwiches is growing larger all the time, but is this kind of mass sandwich consumption sustainable? To find out, researchers at the University of Manchester calculated the carbon footprints of Britain's most popular sandwiches. Their findings, published online last month in the Journal Sustainable Production and Consumption, indicated that the British sandwich industry generates roughly the same amount of carbon dioxide each year as 8.6 million cars. The researchers calculated the carbon footprint of 24 varieties of prepackaged sandwiches, such as egg and cress and prawn and mayo. They also analyzed 16 variations of homemade ham and cheese sandwiches, and compared the carbon footprint of the homemade versions to that of the prepackaged sandwiches. They did this by measuring the amount of energy used during each stage of sandwich production, starting with the cultivation of ingredients and ending with waste disposal. 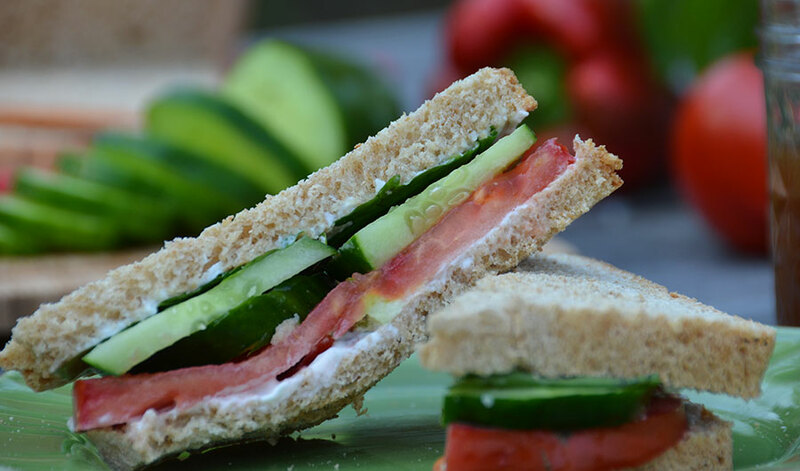 The prepackaged sandwich recipes examined by the researchers were based on the sandwich manufacturing specifications of the U.K.'s largest sandwich producers. Unsurprisingly, sandwiches made with meat and cheese had the largest carbon footprints. A breakfast sandwich containing pork sausage, eggs, bacon, ketchup and mayonnaise had the largest carbon footprint of the examined sandwiches. Production of this prepackaged sandwich creates the same carbon footprint as driving 12 miles in an average passenger vehicle. Vegetarian sandwiches had some of the smallest carbon footprints, except for ones made with cheese. The inclusion of cheese in vegetarian sandwiches resulted in the carbon footprint of those sandwiches being comparable to or even higher than that of some meat sandwiches. For example, a prepackaged cheese Ploughman’s sandwich, which is made with cheese, onions and pickles, has a larger carbon footprint than a chicken and bacon sandwich. “Those findings weren't that surprising to me, but it's a good way to reinforce the notion that things that are high in red meat, cheese and fish are going to have higher footprint,” said Raychel Santo, senior research program coordinator at the Johns Hopkins Center for a Livable Future in Baltimore, who was not involved in the study. 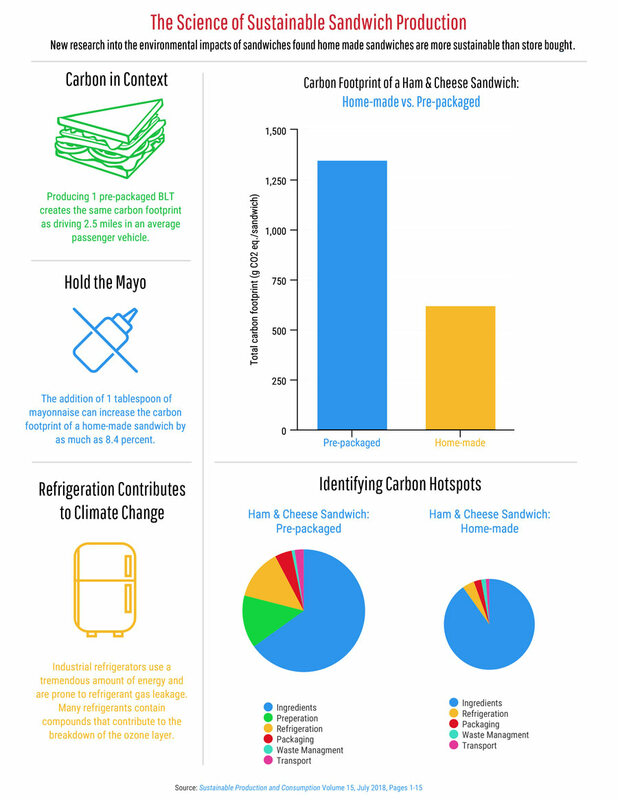 The study also compared the carbon footprints of prepackaged versus homemade sandwiches. The researchers calculated the carbon footprint of the average homemade ham and cheese sandwich by examining 16 variations on the recipe. The carbon footprint of the homemade ham and cheese was around half the size of its prepackaged equivalent. “There's generally less waste associated with the supply chain of homemade sandwiches and there's also less energy involved in the preparation and the cooling of homemade sandwiches,” said Santo. “Waste could be reduced if these ready-made sandwiches didn't have such a short shelf life.” British retailers are expected to dispose of prepackaged sandwiches if they are not sold within 48 hours of delivery. Scientists estimate that one-third of prepackaged sandwiches are never consumed. Ironically, Azapagic has no appetite for sandwiches. However, she does encourage others to reduce their environmental impact by choosing homemade sandwiches over store-bought. “People should make sandwiches at home because it's generally cheaper and it may be tastier because you will use exactly the ingredients that you like,” she said. “You may also reduce home food waste by using remains of the food from a previous day." Annie Roth is a freelance journalist based in Santa Cruz, California. She uses journalism to put a spotlight on marginalized conservation issues. Follow her on Twitter @AnnieRoth_AtSea.